You refer. They ship. Everyone saves! 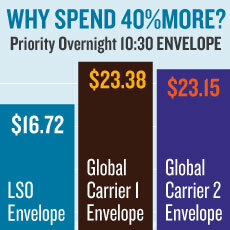 Want to save even more when shipping with LSO? You’ll receive a Referral Bonus: For every new customer you recommend, you’ll receive a Referral Bonus credited to your invoice based on how many packages they ship with LSO, up to the entire amount of an invoice.*. The more they ship, the bigger your credits! Remember, you can refer as many companies as you want. Friends you refer receive a Start-Up Discount: The new customers you refer will enjoy a Start-Up Discount on shipping rates and the same great attention to detail and customer service you get every day. You’ll enjoy being rewarded for their shipments. That’s what we like to call a save-save situation. Receive the Referral Bonus every time they ship! : When you refer a new customer to LSO, a credit of $1.00 for every package they send using any of LSO priority shipping services and $0.25 for every package sent using LSO Ground* will automatically be applied to the balance on your invoices. We hope you’ll enjoy the benefits of our referral program, and that you understand just how grateful we are to you for being a loyal customer. Fill out the form below and start earning with LSO today.